Making the decision to breastfeed isn’t always easy. In fact, it can be really complicated. That’s why we’ve captured all you ever wanted to know — and more — about the benefits of breastfeeding and the decisions you make during the very first hour of your baby’s life. Really? ReallyTM is your online resource for breastfeeding facts, making smart decisions during baby’s first hour of life and the benefits of skin-to-skin contact. We think you’ll be surprised. Really! Expand the menu below to learn the facts and visit the resources tab to download these graphics to share. For better results and more information, please use landscape orientation or view this site on a desktop computer or tablet. Breast milk is the natural formula which benefits both the mother and baby. It can lower the risks disease, is cost-effective and has extremely high nutritional value — well beyond any artificial formula. There are many more benefits of breastfeeding. Find them here on the full website. The Sacred Hour is the baby's first hour after birth, where the baby is placed skin to skin on the mother's chest. 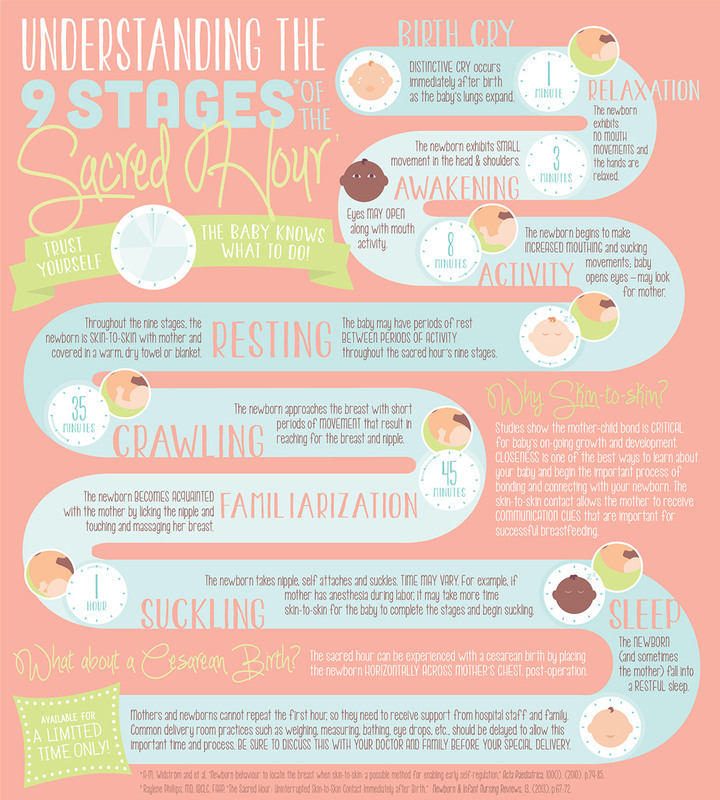 Naturally, the baby takes on nine distinct stages within that hour which can aide his or her ability to initiate breastfeeding. There are nine stages in The Sacred Hour. See them here on the full website. Studies show the mother-child bond is critical for baby’s on-going growth and development. Closeness is one of the best ways to learn about your baby and begin the important process of bonding and connecting with your newborn. The skin-to-skin contact allows the mother to receive communication cues that are important for successful breastfeeding. Find more information on skin-to-skin on the full website.